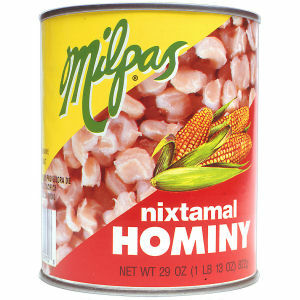 Milpas Nixtamal Hominy is made from 100% corn and has no additives other than water and salt. This very strict limitation of ingredients gives Milpas Nixtamal Hominy that extra special home style corn taste. Even the color of our corn is different than the rest due to the fact that we have not added any color retention ingredients that may take away from the flavor.